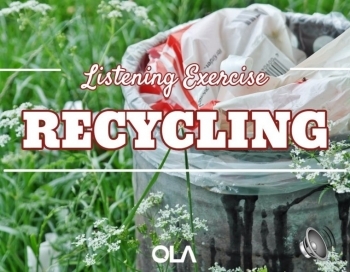 Este ejercicio de listening nos explica porqué deberíamos reciclar. También aprenderás lo que pasa con las botellas de plástico si no las reciclamos. Es un ejercicio de listening avanzado y la chica habla bastante rápido, entonces quizás hará falta escuchar el vídeo varias veces para poder contestar a todas las preguntas. 1. It's just one bottle. It's not ___ ___ __ ___ _____ if I don't recycle it. 2. ...as much as 12% of all U.S. _____ _____ is plastic products. 3. A far more energy and cost _______ process than making a new bottle from raw materials. 4. ..because it's not __________ it will sit there forever, taking up space..
5. "The _______ American uses about 167 bottles of water each year." 6. And of _____ 167 bottles, that average American only recylces 38 bottles. 7. It's great to be able to grab a bottle when you're _______ through an airport and dehydrated. 8. And we can keep that ______ going. 9. It's a really small thing to do, but the ______ is significant. 10. So how often do you guys ____ ______ old bottles until you find a place to recycle them?